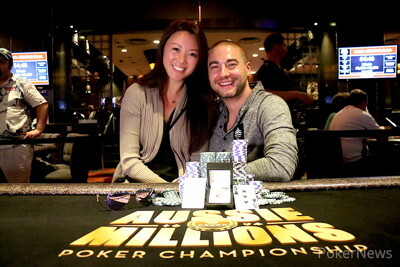 Day 2 of the 2016 Aussie Millions $25,000 Challenge – a tournament that attracted 122 entries (100 unique + 22 reentries) and created a AUD$2.928 million prize pool – saw 26 players return to action, but by the end of the night just one remained as Chance Kornuth vanquished all others to capture the AU$790,560 first-place prize, the second-biggest score of his career. It marked the third 2016 Aussie Millions cash for Kornuth, who finished ninth in Event #6: No-Limit Hold'em Six Max for AU$9,415 and eighth in Event #3: No-Limit Hold'em Shot Clock Shootout for AU$4,520. Kornuth, who won a World Series of Poker bracelet back in 2010, was also less than two weeks away from finishing seventh in the PCA $25,000 High Roller for $192,780. The win was made all the more special for Kornuth as he was down to just 5,100 at the 800/1,600 blind level on Day 1. He found himself all in in six of the next seven hands, winning each time to put himself back in contention. Kornuth said he was 50/50 to play the $100,000 Challenge, which is slated to start in a mere 10 hours. 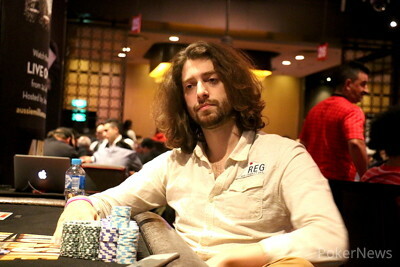 When action resumed on Saturday afternoon, a dozen players needed to hit the rail before the money, and among those to leave empty handed were 2015 GPI Player of the Year Byron Kaverman, online star Daniel "Jungle Man" Cates, EPT12 Malta champ Niall Farrell, and Australia's Dean Spagnuolo, who finished as the bubble boy when his pocket sixes failed to hold in a standard race situation. From there, the in-the-money finishes began to mount on the way to the final table of seven. Those who fell short were Team PokerStars Pros Yaxi Zhu (14th – AU$58,560) and Eugene Katchalov (10th – AU$87,840), as well as German pros Dominik Nitsche (9th – AU$87,840) and Benny Spindler (8th – AU$109,800). It took several hours for the next player to fall, but it happened when Michael Egan, the last Australian left in the field, ran pocket jacks into aces. After Phanlert Sukonthachartnant and Oliver Price were eliminated in sixth and fifth place respectively, Steve O'Dwyer, just over a week removed from winning the 2016 PCA $50K Single-Day High Roller for $945,495, followed them out the door in fourth. Not long after, Jason Les hit the rail after running two pair into Kornuth's set, which set up a near even heads-up match between Kornuth and Igor Kurganov, who was looking to win the title for the second time in four years after taking it down in 2013, albeit in a field of just 30 runners for a top prize of AU$275,000. The two jostled back and forth for a bit, but before long Kurganov pulled out to a healthy lead only to have Kornuth battle back. Eventually Kornuth had Russia's all-time money leader on the ropes, and he delivered the knockout blow after both players flopped a pair. Congratulations to Chance Kornuth, the 2016 Aussie Millions $25,000 Challenge champ! In what would be the final hand of the tournament, Igor Kurganov raised to 100,000 from the button and Chance Kornuth called to see a flop. Kornuth checked, Kurganov bet 170,000, and Kornuth check-raised all in. Kurganov thought about it for 30 seconds or so and then called off his remaining 900,000. Kurganov needed some help to stay alive, but it never came as the blanked on the turn followed by the on the river. Kurganov limped in and Kornuth checked his option. Kornuth check called a bet of 50,000 on before both players checked the on the turn. The completed the board and Kornuth bet 65,000. Kurganov made the call after some thinking, but he couldn't beat Kornuth's . Chance Kornuth limped in for 50,000 and Igor Kurganov bumped it up to 175,000. Kornuth now shoved and Kurganov folded after tanking for about 3 minutes. Chance Kornuth raised to 125,000 from the button and Igor Kurganov made the call. Kurganov check called 75,000 on and another 200,000 on the turn. Both players checked and Kurganov mucked upon seeing Kornuth's . Chance Kornuth raised to 125,000 from the button, Igor Kurganov called, and the flop fell . Kurganov check-called a bet of 75,000 and then check-called one of 150,000 on the turn. Action went check-check on the river, and Kornuth showed the , which turned out to be good as Kurganov sent his cards to the muck. Igor Kurganov raised to 130,000 from the button and Chance Kornuth made the call. Both checked on before Kornuth bet 150,000 on the turn. Kurganov called, but he folded to Kornuth's 500,000 bet on the river. Igor Kurganov raised to 130,000 from the button, Chance Kornuth called, and then both players checked the flop. After the dealer burned and turned the , Kornuth led out for 150,000 and Kurganov called before both players returned to checking on the river. Kurganov showed the and it was good enough as Kornuth mucked. Igor Kurganov made it 130,000 to go from the button and Chance Kornuth in the big blind made the call. They both checked on before the hit the turn. Kornuth fired 200,000 into the middle and Kurganov called. The river came the and Kornuth now bet 395,000. Kurganov thought about it for just a bit before he folded.